Containment. The word arrived, fissuring itself in to my consciousness on Day 4 of our float through the Grand Canyon when the Redwall cliffs—800 feet of sheer limestone—shot up beside us. At first, it seemed to be a curious word to carry in a place formed by catastrophic, uncontained forces, but I let it stay and whittle its way around in my head. On the morning of Day 3, a few of us had tried to make it from the river up to the rim. We jogged back into South Canyon on an easy contour then turned east to push up steeply. We climbed through layers of Supai sandstone, and could see the cool colors of the Kaibab Plateau—blue flecked with white—off to the north and west. 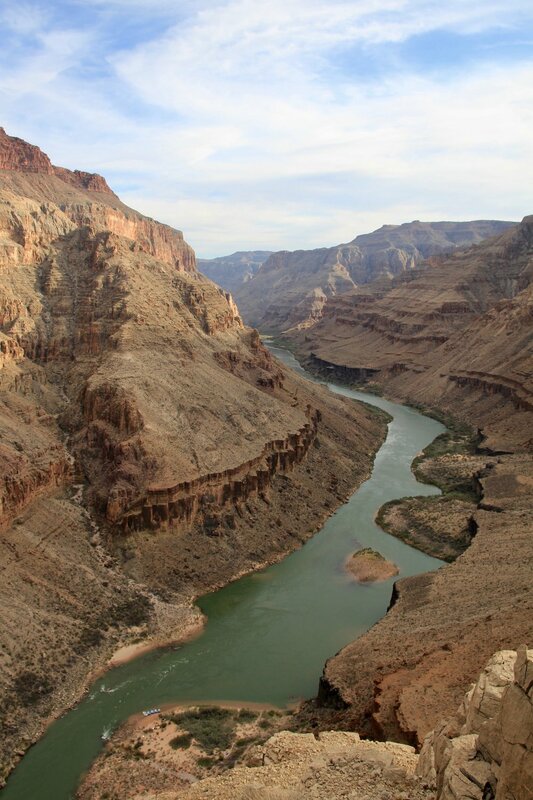 As we moved downriver, the Kaibab would slide in next to the Canyon and our rim would rise up to 7,500 feet, 2,000 feet above where we were now. Here the rim appeared attainable. The Canyon had other thoughts. On top of the Supai layer, looking up towards the pastel Coconino cliffs, our route onwards was unclear. The launch time for the day was noon. We snapped photos, looked down on our toy boats below, and headed downhill. On Day 7, we reached rimwards again. An hour of climbing took us to the Tonto platform. To the south, flats of red sand, barrel cactus, and yucca stretched for miles until they reached another rampart of sandstone cliffs. To get there would take a few more hours. We turned around. On Day 15, we punched above the Redwall limestone layer in Matkatimiba Canyon. The glaring sun and an indistinct passage through the Supai cliffs again turned us back. Each time I tried to break out, the Canyon wanted to keep me. As the days clicked by, I acquiesced; I let the Canyon contain me. Before rafting down the Grand Canyon I had been told that three weeks floating through it would be an impactful experience, one I didn’t want to miss, an experience that might alter the steady state of my life. Mostly, I dismissed these thoughts. I had been on plenty of long backcountry excursions in incredible places. What would be different here? What would shift in me that had not already shifted? Though I wouldn’t realize it fully until I left, from the first day the Canyon was scouring me down and changing me. As I settled into the belly of the Big Ditch, I let myself fall in line with its patterns. Measurement of time was the first thing to drop away. Counting time in days seemed absurd next to rock that was 1.6 billion years old. I took off my watch. My day adopted a timeless pattern: eating, rafting, eating, rafting. Walking, cooking, eating, laughing, sleeping. Slowly, the elements of the Canyon—sun, water, sand—folded me in. My eyes began itching and burning from too much sand in them, my hands became cracked and cut from dry air and sharp stone, and my cheeks turned red and hot from hours beneath the sun. As the days meshed together, worries from beyond the rim dissipated. I came to care about three immediate things: understanding my surroundings, nourishing my body, and connecting with the fifteen other individuals I was rafting with. At times, the lack of thought I gave to the world outside the Canyon surprised me and seemed selfish and privileged: I had cut off from both the cares and the responsibilities of living in a society. On the other hand, what I came to care about in the Canyon seemed to be the exact things I should be caring about: taking care of my local community, allowing time for self-reflection and nourishment, and understanding my place. Everything else, all the chatter of our culture, had been stripped back and I was left doing something very familiar to our species for millennia—moving, in a small, close-knit group, to a distant destination, by way of water. Movement by water should be nearly as natural as walking to us. From the Euphrates to the Nile to the Mississippi, the vast majority of human flourishing has occurred beside rivers. Rivers do the hard work of finding easy ways through complex landscapes and we have always followed them, allowing us to travel long distances, with minimal effort, through remote terrain. As we settled into our routine of moving ten to twenty miles a day on the Colorado, the patterns of the Canyon became apparent. Constantly, we shifted from stillness to chaos and back. Most of the time the river would spread and deepen in long languorous swirls. The current would became hard to find. And then suddenly—lunging and falling— it would become something else entirely—a frothing, seething nightmare with waves that would try to escape the laws of surface tension and flip our boats. If you put a microphone in the Canyon over millions of years the resulting recording would mirror the sound of the river: centuries or millenia of quiet, interrupted by a volcanic eruption, or a massive flood, or a hundred debris flows at once carrying boulders the size of cars down side canyons. At each camp we stopped at, you could walk up a side canyon and notice the aftermath of violent forces. And yet, it all seemed to be still—in stasis—and in a few more turns you would lose the shush of the river and fall into a full silence. I found myself adopting the duplicitous nature of the Canyon: I moved energetically outwards and upwards to capture the scope of it, but I also stayed still, stopped often, sat down and allowed myself be contained by it. In increments, the Canyon swallowed me. I became accustomed to the call of the canyon wren that descended in tone and fizzled out at the same time. I became accustomed to traveling through a world of hulking shadows in which the sun took a long time to greet us and a short time to say goodbye. As always, when you lose track of time, it tends to pass by in a flash. And what you are left with when you return is not just distinct memories but an abiding sensation: this is what it feels like to be swallowed by a canyon and eaten by the crust of the earth; this is what it feels like to remember that you are made of the same elements as the red sandstone, the frothy water, the new, green cottonwood leaf; this is what it feels like to remember that these elements—our elements—are meant to move, to break down, to shift suddenly—to change. Nicholas Littman teaches poetry to 4th graders for the Missoula Writing Collaborative and human-landscape relationships to college students for the Wild Rockies Field Institute. He has published essays in The Montana Quarterly, The Hopper, Blueline, Camas and elsewhere. He lives in Missoula with his wife. More of his writing and photography can be found at lotusfromthemud.wordpress.com as well as in the upcoming Winter 2018 issue of Camas.